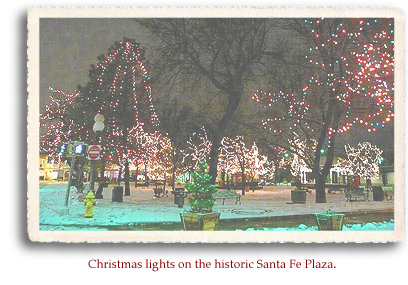 Visit the historic Santa Fe Plaza on any chilly, clear evening from Thanksgiving to New Years Day, and you will find silvery lights strung on every tree, sparkling against the gray winter dusk. The farolitos, luminous brown paper bags of candles and sand, are lit by hand each night, to flicker on the rooftops of the surrounding adobes. The City Different has a hushed, reverent quality a this time of year, regardless of the number of locals and tourists who partake of the numerous holiday festivities. The Sangre de Cristo Mountains are typically covered in snow, as are the Jemez Mountains across the Rio Grande Valley to the West. The high desert expanses of Northern New Mexico could actually be compared to the Holy Land, but only Santa Fe (and the surrounding area) has chili, red and green (and those wonderful ristras), posole, tamales, blue corn tortillas, and bizcochitos (tiny anise Christmas cookies that are the official state cookie of New Mexico). The classic Santa Fe Christmas can be summed up by the piquant scent of burning pinon wood in the clear night air, the temperature hovering in single digits, and with softly falling snow, the city is transformed into a winter wonderland. Many of the restaurants offer holiday specials and the citys hotels often stage Christmas events featuring music, storytelling, and craft demonstrations, all reflecting the diverse cultures of the region. Yet, when digging deeper, Santa Fe is a place of ritual, where the area's distinctive blend of Native American, Hispanic, and Anglo cultures is played out in seasonal traditions that call visitors back to The City Different year after year. Because the community has such rich cultural history, the celebrations that can be found around town are unique. During the city's famous Christmas Eve Canyon Road farolito walk, the electric street lights are turned off, providing a more provincial feeling in the now updated city. 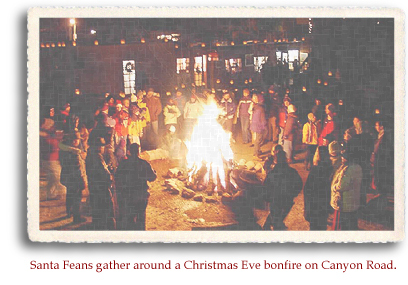 While tourists (and some locals) mob Canyon Road, the city's art gallery area, longtime Santa Feans descend on historic side streets like Acequia Madre, breaking into Christmas carols as they gather near fragrant bonfires of stacked pinon wood. 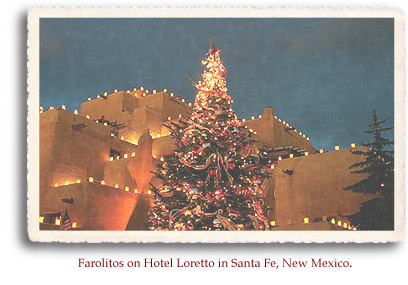 Although they are now synonymous with a Santa Fe Christmas, farolitos are a somewhat modern addition to the season. Early in the century, a group of architects, artists, archaeologists, and tourism promoters got together and codified into law Santa Fe's authentic adobe look. Farolitos were adopted in 1971 by a group of neighborhood associations celebrating a zoning ordinance protecting against rampant overdevelopment. At Santa Fe Plaza (and in surrounding communities) the nine days leading up to Christmas are the time of Las Posadas, house-to-house reenactments of Mary and Joseph's search for a room at the inn, accompanied by traditional Spanish hymns. It begins at the Palace of the Governors, winds around the Plaza and is open to anyone wishing to join the procession. By the end of the walk dozens of people have joined the Mary and Joseph characters as they end at the place of Jesus' birth. On Christmas Eve, the Cathedral of St. Francis celebrates a round of Masses in Spanish and English, including a Children's Mass, a Midnight Mass, and a Mariachi Mass on Christmas morning. At the Palace of the Governors, off the Santa Fe Plaza, an annual celebration of Hispanic, Native American, and Anglo Christmas traditions takes place with carols, story telling, Santa and his elves, music, cider, and cookies. On the historic Santa Fe Plaza, Native American artisans display traditional arts and crafts, and turquoise jewelry including rings, earrings, necklaces and belt buckles. This is a perfect spot to shop for authentic Santa Fe and Southwestern style gifts. Baroque music and Old English carols fill the historic sanctuary throughout the holiday season. Four-hour roundtrips are conducted through the beautiful Galisteo Basin, including a stop for lunch in Lamy. Special train trips during the Christmas season include: Caroling with Santa Claus, the Polar Express (the popular book is read onboard), the Holiday Starlight Train, and a Hanukkah train. 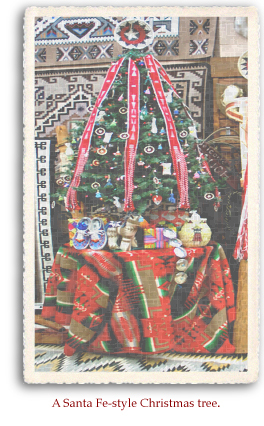 This annual winter market is presented by the Spanish Colonial Arts Society. The group is dedicated to the preservation of traditional Spanish Colonial art such as tin work, straw appliqué and Santos carving. Furniture and silver work are also found at the market. Held in early December, it is a great place to shop for gifts that truly reflect this aspect of Santa Fe's cultural roots. Holiday dances are held at the Tesuque, Pojoaque, Nambe, San Ildefonso, Santa Clara, San Juan, Picuris, and Taos Pueblos. Among them are the Mattachines and Comanche dances, hybrid forms strongly influenced by the Spanish-colonial past. And although dances vary from pueblo to pueblo and year by year, they are all a form of communal prayer, marking the joining of native and Catholic holy days. 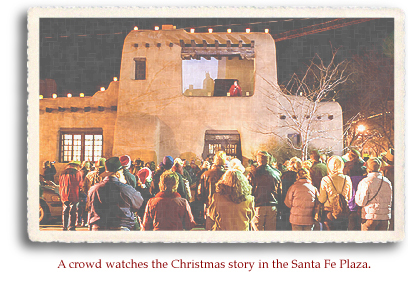 This celebration features traditional dancing and feasts held in the homes of members of the Pojoaque Pueblo. Visitors may be invited to dine with tribal members. The Virgin of Guadalupe is the patroness of the Americas, who first appeared to Juan Diego, a recently Sainted Mexican Indian, in 1531. Typically all 43 of the Ski Santa Fe runs open by Christmas day. Located 16 miles from the downtown Plaza, it is 3,000 feet higher than the city and normally gets 225 inches of snow a year. The Santa Fe Film Festival features Hollywood premiers, independent features, documentaries, world cinema, animation, and short subjects. The festival events include parties, film panels, and much more.